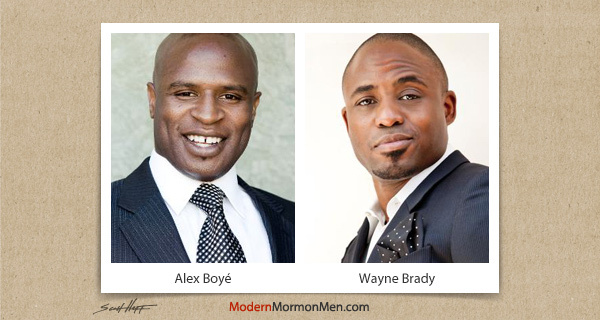 You probably know Alex Boyé as a noted LDS recording artist and member of the Mormon Tabernacle Choir. You may even know he was lead singer of famous UK boy band Awesome, which frankly is ... awesome. Additionally, I just discovered Alex served in the same mission as me in England. I bet none of you knew that. You've seen Wayne Brady on Whose Line Is It Anyway?, The Wayne Brady Show, Don't Forget the Lyrics, and Let's Make a Deal, among many other TV shows. Although Mr. Brady could almost pass for Mormon, he's officially not. I have proof. So what do these two gentlemen have in common? 1. Wayne Brady sits on the celebrity board of Ronald McDonald House Charities. Alex Boyé worked at McDonald's as a teenager. 2. Wayne Brady hosts Let's Make a Deal. Alex Boyé makes lots of deals. 3. Both have met '80s/'90s icons George Michael and MC Hammer. 4. Both have squeaky clean public personas. Wayne Brady, however, revealed his disturbingly devious dark side on an infamous episode of Chapelle's Show. What are you hiding under there, Boyé? Check out Alex's website here.